Do you have plans for lunch next weekend? Cancel ’em. 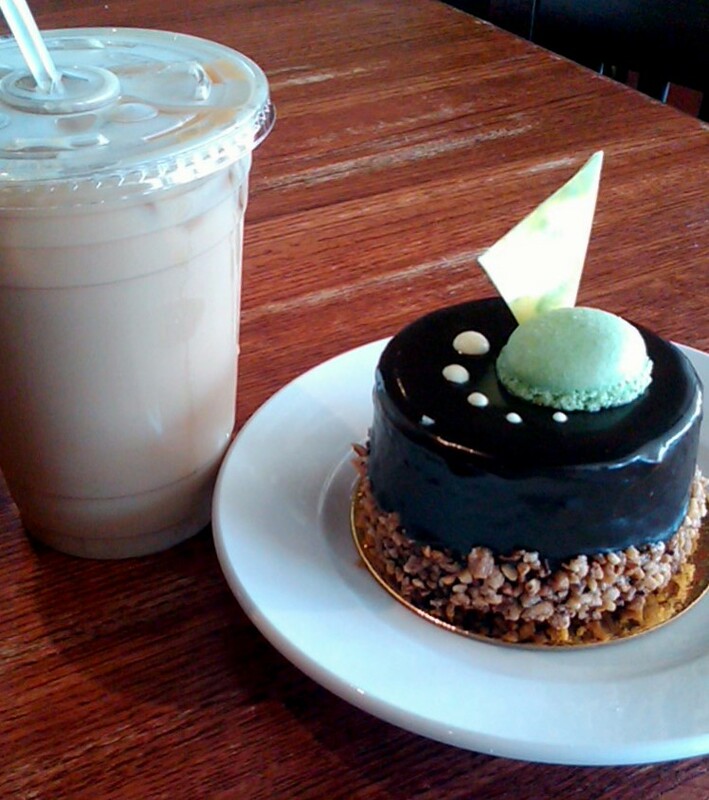 A favorite place to get dessert? Get ready to reconsider. Plans to cook? Put down the apron. 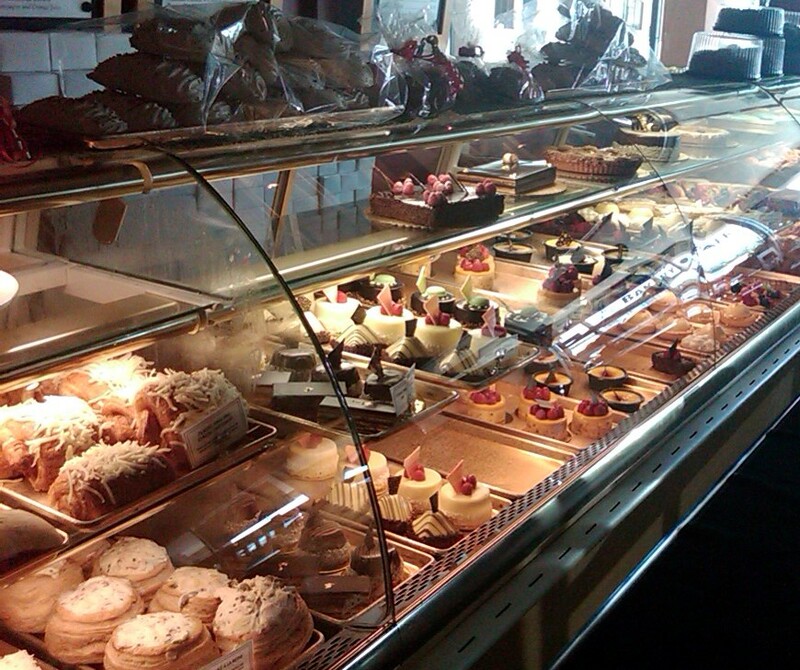 You need to try Patrick’s Bakery & Cafe – a place that’s much more than the strip mall coffee shop it appears to be! One reason that I was on the edge of my seat to visit Patrick’s was its charming back story: Patrick Bernet – from French culinary child-wonder to prestigious award winner to military man, he’s acquired an impressive resume’ of positions as Chef and Instructor throughout the world and finally wound up in the Twin Cities (thank you, fate!) as Pastry Chef at the Hotel Sofitel where he decided to open his own bakery and cafe. 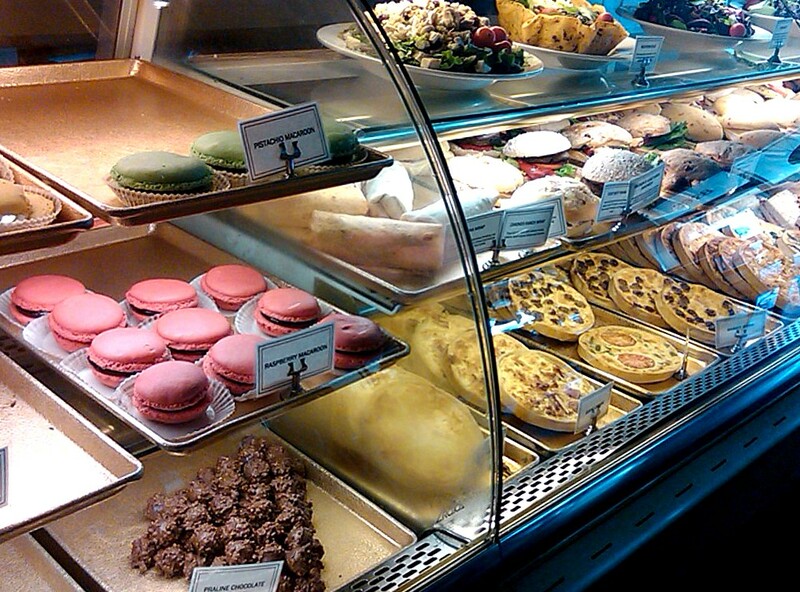 Just walking into Patrick’s, the bakery case that runs the entire length of the wall showcases Chef Bernet’s emphasis on beautiful, pastry perfection. Each tray of sweets, cakes, breads and pastry reflect an incredible attention to detail and food perfectionism. There were so many different amazing looking options, I ended up pointing at and asking about a lot of different items…the woman behind the counter was extremely helpful and offered her recommendation: Sarah Cake. Get ready for this – it looks amazing! 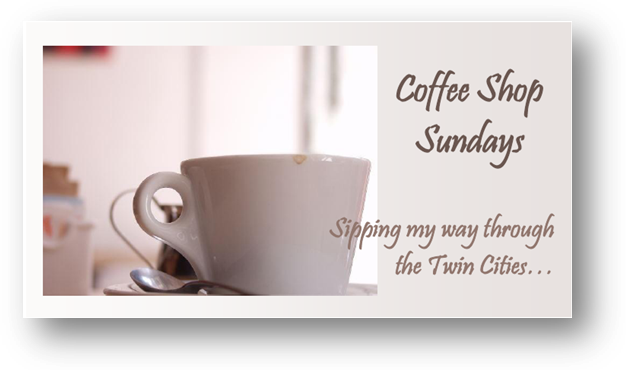 First of all, the latte’ was great – really delicious and refreshing! I wanted so badly to take it out and enjoy it in the outdoor seating area beautifully decorated with ivy and lights, but it was so hot I was worried that my cake would melt! 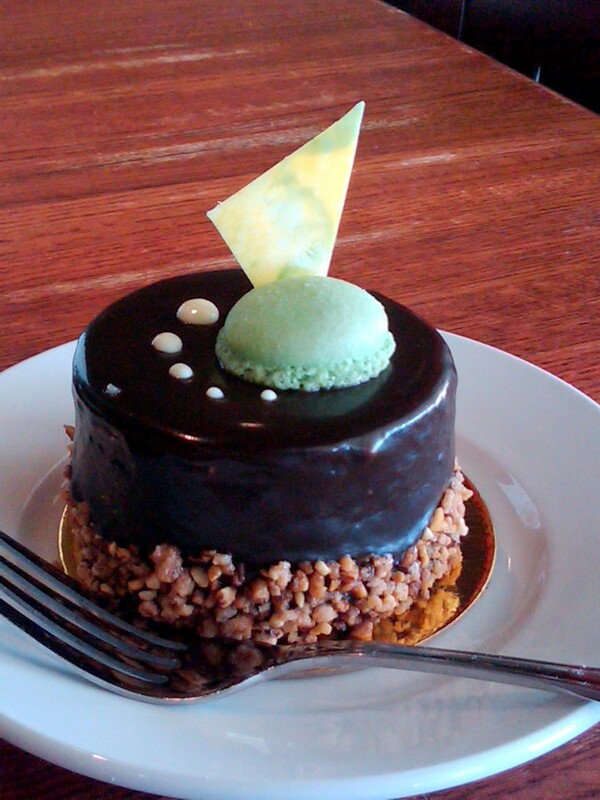 I so thoroughly enjoyed this cake – dark chocolate ganache and candied nuts covering a chocolate mousse, chocolate and vanilla sponge cake, all topped off by a mini pistachio macaroon and beautiful artisan white chocolate garnish. 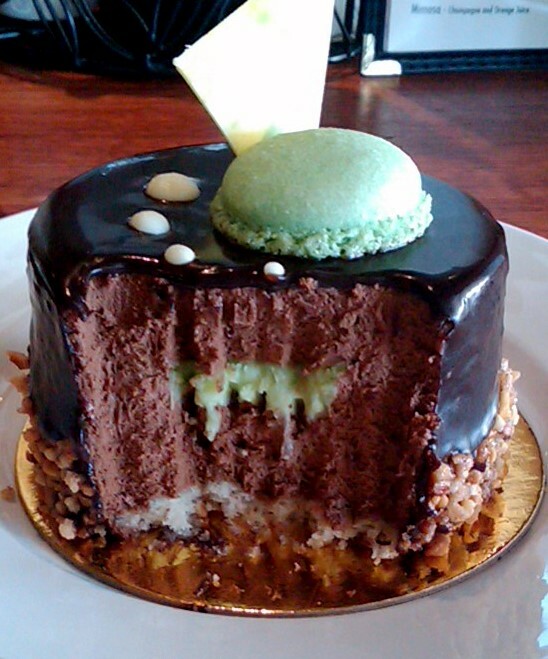 I honestly exclaimed out loud when I discovered the pistachio mousse surprise in the center! I really can’t say enough about this cake – it was beautiful, smooth, rich and light, all at the same time. I am going to see it in my dreams. There were a couple of things that I didn’t care for at Patrick’s: food was served on green trays which reminded me of standing in line at the school cafeteria and there were a couple of small things placed around the cafe that stood out to me as not jiving with the warm, rich ambiance that Patrick’s tries to create, like a large digital sign showing the room capacity. The atmosphere is distinctly charming, though, and obviously personal to its owners which far outweighs these little details. 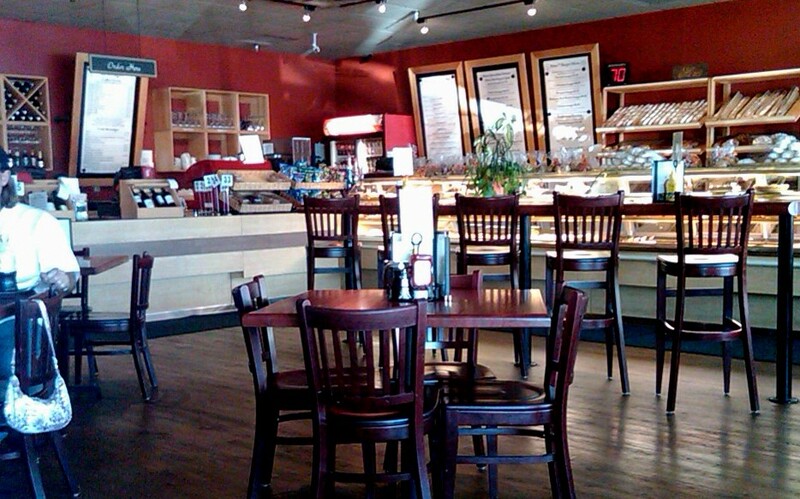 …luckily, Patrick’s Bakery & Cafe is right here in the Twin Cities – I can feel like I’m visiting France without the 15 hour flight! Bringing you good food, fun projects and whatever adventure happens to be going on at my dining room table! Professionally, I'm a Corporate Trainer....to my favourite 4 year old, I'm Mom! I live in a little apartment in Minneapolis and try to spend as many moments possible doing what we love and bringing those fun successes and (sometimes even more fun!) failures to your computer screen. Adventurous? Enter your email address to subscribe to this blog and receive notifications of new posts by email.